What does the Rosary have to do with running or fitness and why am I writing about it, you may be asking? Well, see I’ve had a problem for the past few months – I’ve been trying to find a way to blend two of my favorite things together – my faith AND my love of fitness. I have a co-worker, Val, who does an amazing job with this. She’ll have prayer cards that serve as motivation for her clients, she’ll recite scripture passages as they workout together, and she just exudes holiness and a Christ-like life thru her actions and her words. It’s very inspiring. There’s also a few brands/companies that have blended these two worlds together. Have you ever finished your set and thought, What Would Jesus Deadlift? Wear this comfortable shirt at the gym to motivate you and those around you while you workout to meditate on what Jesus lifted. That weight on that cross was all of our sins, yours and mine. Just as Jesus picked up that cross, you can pick up that weight! Our Vision: We are not here to just sell shirts and become rich. We are here to help send a message with this design. God has called us to challenge others to put some thought to “What Would Jesus Deadlift?” What does that mean? How does that relate to my fitness lifestyle? My spiritual journey? Am I taking what Jesus did on that cross for granted? Think about it. Make others do the same. Our Mission: We are here to give back. With every purchase you make, we make a local impact here in Fresno, CA as we reach out to others by giving them a free t-shirt, help with food, talking and ministering to others on “What Would Jesus Deadlift”. We hope you can be part of it! PrayFit Ministries – The mission of PrayFit Ministries is to help the collective church with humble, bodily stewardship, and to help those in the health & fitness industry toward a personal relationship with Jesus Christ. In The PrayFit Diet, NYT best selling author Jimmy Peña shows us how faith is the most powerful tool we have to conquer all of life’s obstacles, and that includes our health. More importantly, God wants you to be at your best, physically and spiritually. By combining perfectly proportioned meals with Biblically based motivation, The PrayFit Diet will give you all the tools you need to live a life that will both inspire you and honor the Lord. So what about me? I don’t have a clothing line…I’m not a best selling author….I’m not a professional figure competitor with a large following. How can I use my faith to promote a healthy life and help others do the same? At first, I started a separate blog – Nothing like separation of church and state right? I literally split the two worlds and just started more of a “faith-centered” blog called Fitting in Faith. Well that’s all well and good but that doesn’t solve my problem of actually BLENDING the two. But this morning, I discovered one small way during my long run. I’m training for a marathon in October and I was scheduled to run 8 miles today. I started out listening to music from iPhone which I normally do to keep me motivated. To run in complete silence is definitely do-able but not ideal when you have a run longer than a couple miles. Today, it was about 80 degrees during my run which means I probably felt like it was around 85-90 degrees. To say this was challenging would be an understatement. 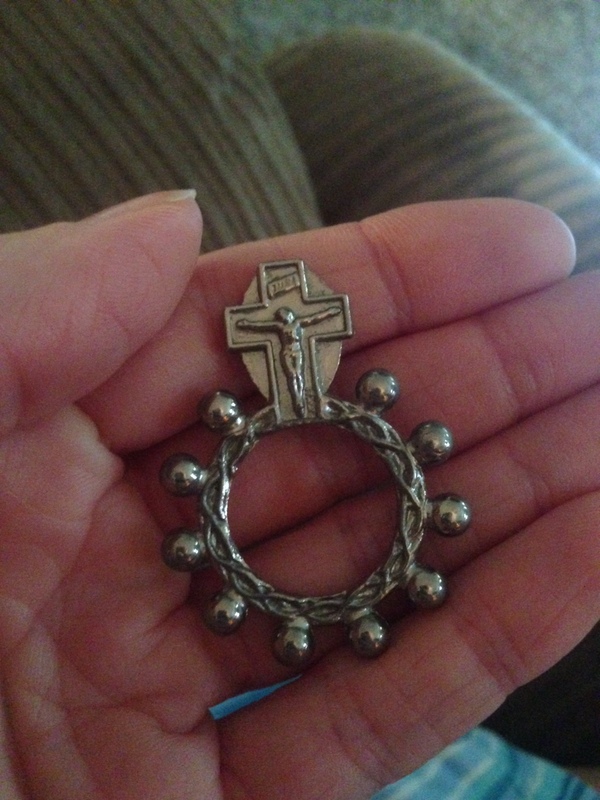 I grabbed my Mom’s rosary that she had with her for the final years of her life while she fought lymphoma. It was a perfect way to pray a rosary because, as you can see from the picture, it fits right around your thumb! I made it from mile 3 to mile 7 praying through the Luminous Mysteries as well as the Sorrowful Mysteries. Each Mystery takes about 25 minutes to pray through so for me, given how slow of a runner I am, that equated 2 miles. I was actually able to meditate and pray without getting distracted too much. Anyone who knows their rosary knows getting distracted while reciting the same prayer over and over again is a common occurrence. But I think because I was actively moving (running, in this case) I was surprisingly able to stay focused. The time it took to get through this sweaty run went by very quickly. While most of the time, listening to music DOES kinda get the blood flowing and the legs moving, it still seems like it takes FOREVER for me to complete my miles. This time, I felt motivated by the words being prayed. Kind of like a chant? Whatever it was, it helped pass the time. For those who have no idea how to pray the rosary, or how to stay focused when distractions come up I have a few good resources listed here. The word rosary itself is Latin and translates along the lines of “a garland of roses.” The story goes that St. Dominic developed the Rosary sometime between the 12th and 15th centuries after having a vision of the Virgin Mary, but prayer beads and cords were used way before St. Dominic’s vision. The Rosary is divided into decades, with each decade starting with a mystery. A mystery is a short reading that focuses on an aspect of Jesus or Mary’s life, with the word mystery meaning “a truth of the faith.” Still a little baffled by that translation of mystery. There are three traditional mysteries (Joyful, Sorrow and Glorious mysteries), as well as the Luminous mysteries, added by Pope John Paul II in 2002. When praying a decade of the Rosary (the Our Father, 10 Hail Marys, Glory Be and the Fatima prayer), Catholics meditate on that decade’s mystery. The Rosary is said for a variety of reasons. We say it because of our devotion to Mary who intercedes on our behalf. Saying it gives us an opportunity to meditate on key moments in Jesus’ life. The Rosary also helps us become more intentional and thoughtful in our prayers. Practically everyone who prays the Rosary “offers” the Rosary to God and Our Lady for an intention. Some people offer particular intentions before each decade. You can ask God to grant you a favor, heal a sick person, or convert a sinner. Some people offer the same intention every day–sometimes for years on end–especially when asking the Father for the conversion of a particular person. Intentions are as varied as the people who pray. It is widely known that Our Lady answers seemingly impossible intentions to those who are first beginning to pray the Rosary. This is her way of drawing you closer to Her and to Jesus. If you are praying your first Rosary, or returning to the Rosary after years of not talking to Our Lady, ask for something big, spectacular, “impossible.” She’ll often surprise you.